This post follows on from The Highs and the Lows: Part 1. I was in the form of my life. I had just run a huge 5K PB on tired legs. I felt fit and fast. But something was bothering me. A very slight pain in my ankle. It didn’t hurt during the Parkrun. It didn’t hurt in the subsequent 18 mile Sunday run along the bay, which I ran a chunk of with the friendly Swansea Harriers TNT group. However, it was hurting after runs. Injury is every runner’s worst nightmare. What did this pain mean? I referred to it as a niggle. It will go away, I thought. ‘It’s not stopping me from running’. The pain seemed to be at its worst in the mornings. I was stubborn and continued to train hard. I was starting to feel the discomfort as I was running but I battled on and repeatedly told myself that it was a bruise or some tightness that will pass. I refused to acknowledge that I was potentially injured. Track Tuesday came around again and I was raring to go but the ‘niggle’ was playing on my mind. As I warmed up I could feel soreness just below my ankle and on the side/top of my foot. ‘I’m sure the pain of running hard will substitute any foot pain I may feel now’ I reasoned. Smashing out quick 300m reps was rough. Ankle pain was a distant memory as I felt the lactic burn in my legs and I choked on the cold air. Wednesday morning and all the demons returned. My ankle was at its worst, but I persevered with a 20 mile day split over 2 runs. I was at my fittest, and I had a huge race on the Sunday where I was eager to perform. 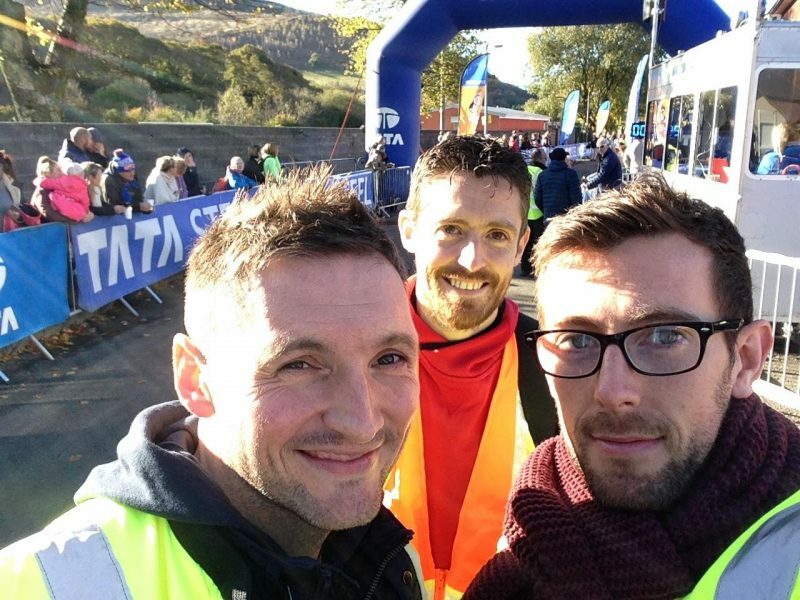 The Abbey Dash 10K in Leeds. I didn’t plan on much of a taper, because I still wanted a big mileage week. I adapted my schedule to make my week top heavy. Lots of miles in the first half of the week and then ease off as I get closer to the big day. The Abbey Dash race always attracts a great British field. There is so much talent there that it makes it easier to run fast. This may sound strange to some people, but if you have a good field you run faster. I always perform better at the big events. I was confident of breaking 32 minutes. I felt so good that I wanted to smash through the barrier. Lots of international runners would be lining the Yorkshire roads. Welsh Athletics had sent two great teams to compete; the seniors and an under-23 team. I was excited to go up North and run fast; beat some of the best runners around; get a big PB; and continue my running development. On the Thursday it all fell apart. I stepped out of bed and my ankle was not happy. I hobbled down to breakfast and decided that I had to take action. As much as I wanted to race on the weekend, I knew I had to address the issue. I did what everyone does in these situations – asked Google what the injury was. Normally I am cautious about self-diagnosis, but Google described my injury perfectly. 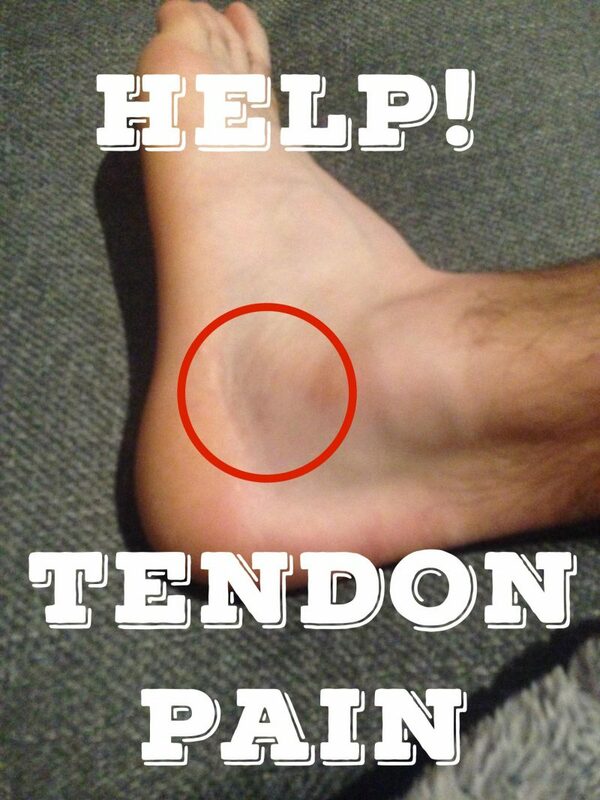 Peroneal Tendonitis. As I researched the problem, it became clear that this injury was not something to ignore. Abbey Dash was off. Sub 32 was gone. I hate being injured. Actually that’s too weak, I despise being injured. I am lucky that during my relatively short time running I have never had an injury which has kept me out for any substantial period of time. Apart from a short spell of plantar fasciitis; which thankfully cleared up after a few days of rest and rolling my foot over a golf ball; I have been injury free for nearly two years. But now, when I feel at my best the darkness of injury has smothered me. When I can’t run I get grumpy. I feel miserable. This is the negative side of my passion for running. If you take it away from me, I struggle to cope. I worry about losing my fitness. I fret over missing sessions. I panic about how long I will be out. I crave the endorphins. I long for the fresh air. I am not a great person to be around when I am caged in this manner. I couldn’t just mope. I had to take action. How could I help the injury recover in the shortest possible time? In order to reduce my time on the sidelines I started to do my research. Some sites were helpful, some less so. Contradicting advice started to frustrate me. I turned to social media. Some people are critical of social media and our new found obsession with ourselves. ‘I don’t want to see what you had for dinner, or how well your gym routine is going’. I disagree. Social media can be isolating but if it is used in the right way it can open you to a community. Since I started running I have met so many people with similar interests on Facebook, Instagram, Strava, and Twitter. I am able to connect with these people. Share ideas. Motivate each other. Social media has accelerated my learning. I quickly started to copy other runners. Tried to understand why different training regimes were working or not. I gain inspiration from seeing other people achieve their goals. I can communicate with runners all over the world, rather than constantly boring Vicki with mile splits and reviews of the latest Garmin devices. I am not saying shut yourself away from the ‘real’ runners you meet at local events. In fact it is a great way to keep up to date with what is happening in the local running community. Anyway I digress. I turned to social media with a problem. I shared my injury and the responses came flooding in. Runners from all over messaged me with advice and support. I was directed to useful online material. I learned what experiences other runners had gone through with the same injury. It was brilliant. Georgina; a talented young runner on Instagram; messaged me in detail of her recent tendon issues. She explained thoroughly what rehab approaches have worked and those that haven’t. Invaluable information. No more hours trying to find the best advice on the web. Personal experiences were helping me put a plan in place to start my recovery. Thank you everyone who contacted me. I really appreciate it, and it was super helpful. So the obvious and most important thing to do was rest. Actually rest though. My first instinct on the Thursday was to cross train. I went to the gym and went hard on the bike. I was going to stay fit, and the extra strength I was going to achieve from the bike would pay dividends in cross country. My calves were tight though. The tendon below my ankle wasn’t getting the complete rest it needed. I started doing eversion exercises with my foot. This consisted of moving my foot outwards against resistance to strengthen the tendon. Self-massage of my tight calves. The foam roller was back out of the cupboard. A neglected golf ball. A spikey ball too. Eddie; my hyper-active Yorkshire terrier; was delighted, it was clear he had been wondering where ‘his’ toys had been hidden. I never really bother with painkillers but I followed advice and started popping ibuprofen to reduce the swelling. I strapped my ankle to provide it with more support. I wanted to do everything possible to get back. I looked to the cause of the problem. I had changed my trainers a couple of weeks previously. Rather than my usual light Saucony Kinvaras I thought it was sensible to use a big clunky shoe to protect my body against the increase in mileage I was attempting. Well, it had a negative effect. I think my gait slightly changed and I was running in an unfamiliar way. This caused an issue. I decided when I did return to running to stick to what my body knows. Kinvaras are back in line as my main shoe. It couldn’t just be the shoes. I realised how much I neglect foam rolling and massage. Well these important aspects of running were put straight back on the agenda. 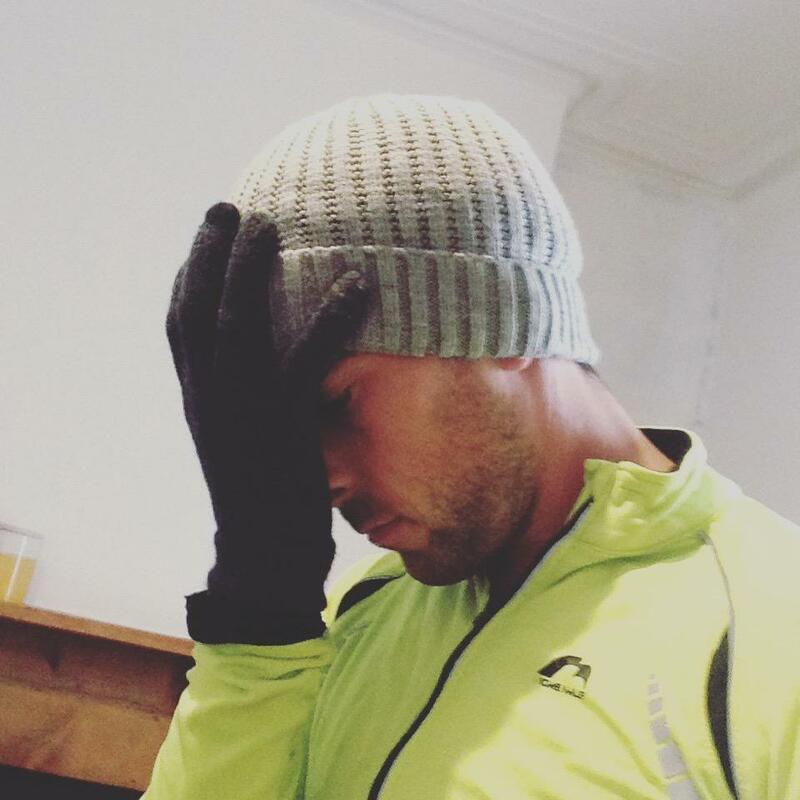 I can’t expect to run 100 miles and my body to recover fully without adopting some of the more boring aspects to running. Four days of rest in and I was moving metal barriers as runners did their strides and prepared themselves for 10 hard kilometers. I had decided to help out at the local Richard Burton 10K race. I had bought an entry in case I couldn’t run in Leeds. Well, I couldn’t run Leeds or Richard Burton. 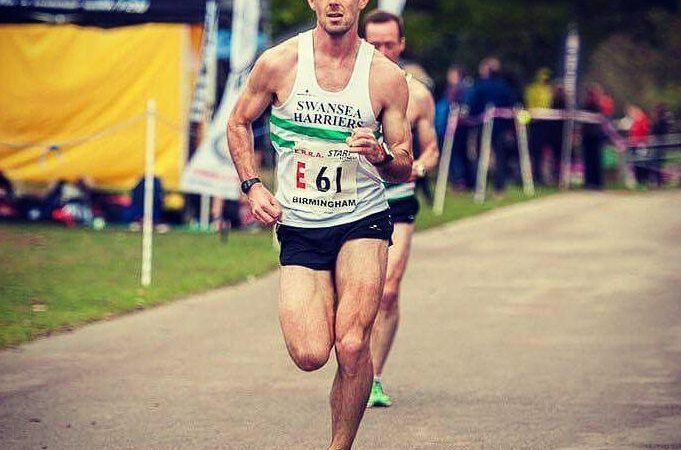 I was happy to give my entry to Rich Copp; a friend and Swansea Harrier; who was finally racing again after his own battle against injury. I was so envious of the boys as they did their drills. I wanted that nervous feeling as a race approaches. I have never helped out at a race before. It was nice to be giving back a little, but difficult to watch as everyone lined up. My mate Paul Morgan; who has been out with an injury for a while; was also helping out. I was finally starting to understand his frustrations at not being able to run. However it was satisfying to still be involved in some small way, and watch as hoards of people gave their final ounce of effort as they sprinted for the finishing line. The race was a huge success, and I gave my guns their first workout for a long time as I helped shift barrier after barrier to a pick up point. Not as easy as it looked. Damn, I really am a scrawny runner now. Maybe I’ll throw in a few curls the next time I visit the gym to cross train? Monday arrived. My fifth day of rest. I didn’t feel any pain. Could my rehab approach have worked already? I impatiently decided to go for an easy few miles to test the ankle. I felt amazing. My legs felt fresh from their rest. It was so great to be back outside running. But was the ankle ok? It seemed fine during the run. The big question was whether it would flare up again when I had finished. Well it didn’t. It seemed to be happy to be back in my old trainers after some rest. I decided to carry on running all week but would not do any faster paced sessions. I wanted my tendon to continue its recovery without any stress of fast paced workouts. After a week of easy paced miles I decided that I had been extremely lucky. I had rested my tendon before it had got to a point where the damage was severe. Four days is nothing. I don’t know why I stress so much about a short break. I could have had a week or two off and my fitness would have returned very quickly. It was a great lesson to learn. If I feel any sort of injury again, I am resting straight away. Months on the sidelines is not worth it. Nip it in the bud early. It’s great to be back. Thanks mate. I really appreciate the feedback. Well done in Manchester Half. How did you find it? What’s next for you? It wasn’t as bad as i thought for my first event, 2:18 i managed. Seeing as i only started running the beginning of this year i think i did ok. Nothing planned as of yet wait and see how the training goes from here on out, possibly another half next year.